The sequential engineering approach, also known as the “over the wall approach,” or the traditional engineering approach. 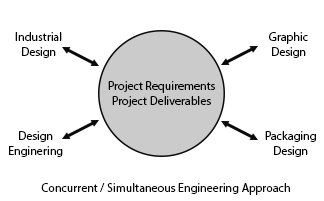 The concurrent engineering approach, also known as the simultaneous engineering approach. This article will explain the differences between the two approaches and provide guidance for breaking down the “walls” of sequential engineering, so you can make the transition to the preferred approach: concurrent/simultaneous engineering. Over the Wall Engineering came about after the industrial revolution, with the introduction of the assembly line and task specialization. In the over the wall engineering approach to product design, each team member performs his or her tasks and then passes that collateral on to the next team member. The term “over the wall approach” came about because each person’s work is handed over the hypothetical (or actual) cubicle wall to the next person. This methodology relies on tasks being performed sequentially and with very little need for communication or collaboration. The primary advantage of this method is that it makes a highly complex project easy to understand and track. This method also makes it easy to identify underperformers. For this method to work as intended, each person has to be given all of the right deliverables and/or specifications from the previous person AND perform his/her task exactly as required, before passing the work on to the next person. Of course, things don’t always go as planned, and issues arise. When an issue does come up, the work has to be passed backward over the wall, fixed, and then sent forward over the wall again. This is called reverse flow and is a major source of this method’s inefficiency. In the concurrent engineering approach, also called the simultaneous engineering approach, team members from different job functions collaborate early and often. In this approach, there are no “walls,” and everyone works together. The general idea behind this approach is that by collaborating, team members can identify and solve issues early on AND can create efficiency by having different team members working on tasks at the same time. This approach does NOT imply that there is no sequence to things. Practically speaking, it just means that IF tasks can be done concurrently, they should be. You won’t want to design a product’s package before you design the product itself, but you can certainly start designing a product’s package before the product itself is 100% complete. Realistically, you should start designing the product’s package once the product’s design is relatively fixed. This approach does NOT imply that EVERY team member must be present at every meeting. Practically speaking, it just means that team members whose job function may be affected by what is discussed in a meeting OR whose expertise could affect the outcome of what is discussed in a meeting should at least be invited to the meeting. 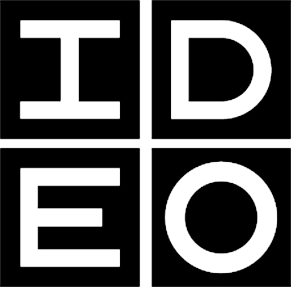 The project’s design engineer or industrial designer might not be needed at a meeting intended to discuss the most recent graphic design options. 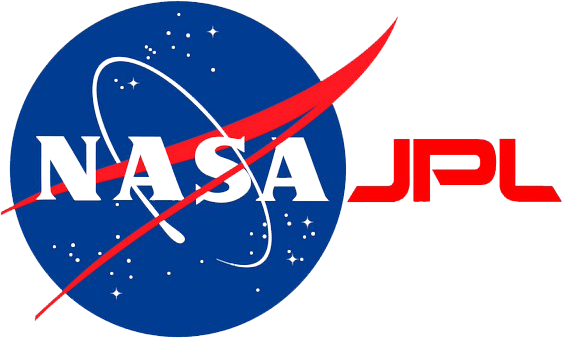 However, if the agenda of the meeting is to discuss how to make more space on the product either for more graphics or for bigger graphics, the design engineer and industrial designer should certainly be present. This approach does NOT imply that specific job functions don’t exist because people will be working together all of the time. Practically speaking, it means that individuals still hold the primary responsibility for his/her job function, but input is welcome from any team member. Why Apply the Concurrent Engineering Approach Instead of the Over the Wall Approach? It turns out that concurrent engineering results in a shorter and less costly development cycle, and arguably a better overall product, than those designed using the over the wall engineering approach. It is for these reasons that the product development community prefers the concurrent engineering approach over the sequential engineering approach. The graph below compares the development time of each approach as it relates to the number of design changes. As mentioned earlier, the concurrent engineering approach is intended to identify and solve issues early on. 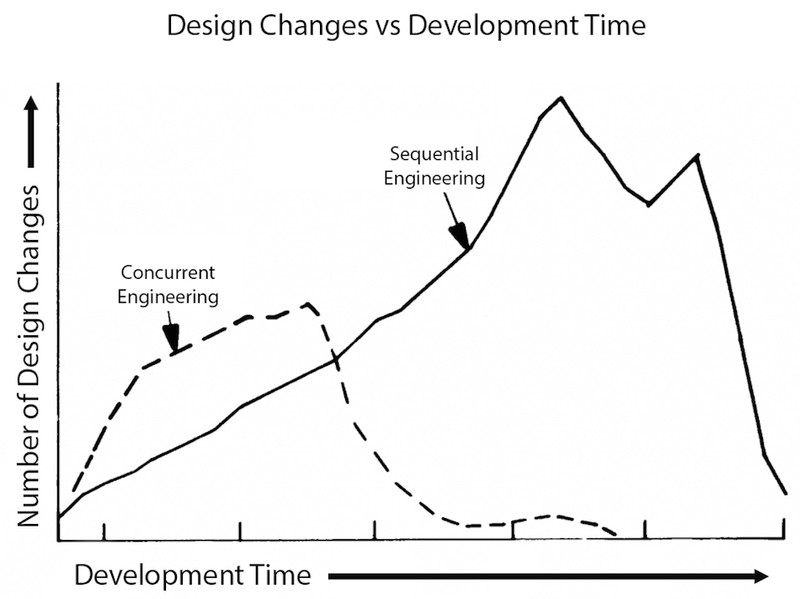 You can see this in the graph, where concurrent engineering undergoes many more design changes at the early stages of development than sequential engineering. In contrast, sequential engineering undergoes the most number of design changes pretty late in the game. These late stage design changes tend to have the greatest effect on a project’s timeline. Concurrent engineering yields more creative solutions because more people have the opportunity to identify, review, and solve a given problem together. Don’t forget that team members likely have overlapping skills. Just because someone’s title is industrial designer doesn’t mean that he/she isn’t skilled in mechanical design or doesn’t have an intimate knowledge of manufacturing processes. Conversely, an engineer might have a great eye for aesthetics and form. 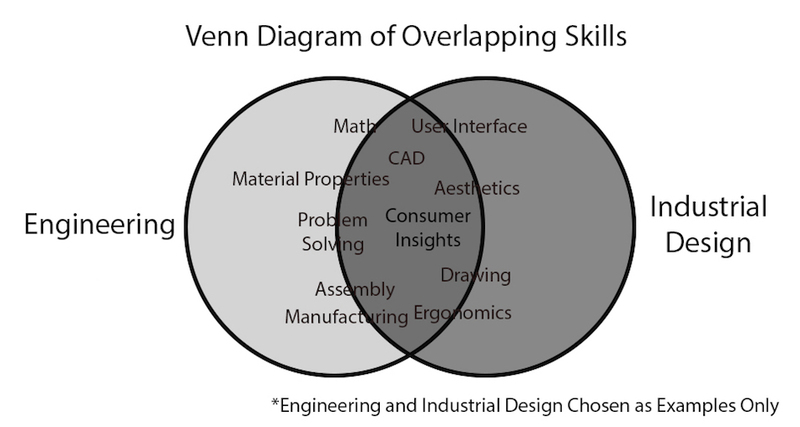 The Venn Diagram below shows a few examples of overlapping skills between an industrial designer and a design engineer. As mentioned earlier, there is likely a specific team member in charge of solving a particular problem because of his/her specialty, but the issue is visible to all team members. Therefore, valuable input can be provided by anyone. Concurrent engineering has more redundancy because team members are more involved in multiple aspects of the development process, instead of just their specialties. This redundancy reduces risk to the project, in case a team member suddenly can’t perform or leaves the project/company unexpectedly. Ideally, your management team is already preaching the virtues of concurrent engineering. If they aren’t, don’t worry. The great thing about making the switch to simultaneous engineering is that it’s easy. All you have to do is start being more inclusive. After all, this isn’t high school anymore. Invite the ENTIRE development team to each project’s kick-off meeting. For follow-up meetings, invite anyone that might be affected by what you are discussing or whose requirements might affect what you are doing with respect to what you are discussing. When in doubt, simply invite the person to your meeting. He/she can always choose not to show up. Don’t forget that the approach you use doesn’t have to be black & white. There is a full spectrum of greys in between to choose from, based on your company’s or your project’s unique needs. There are many ways that product development team members can and do interact with each other. The best way for those team members to interact with each other throughout the product development cycle is early and often. Working together from the start and continuing to work together throughout a project will yield a better product in the shortest amount of time and for the lowest cost. This method, called the concurrent/simultaneous engineering approach, is the industry standard. So get out there and start breaking down some walls! Share this article with your friends and colleagues, and get them excited to break down some walls, too. Break down all those walls and design really great products! After all, those walls just slowed you down and added cost. You don’t need them! Professional product design and development consultant with a specialty in plastic consumer products, especially for injection molding.